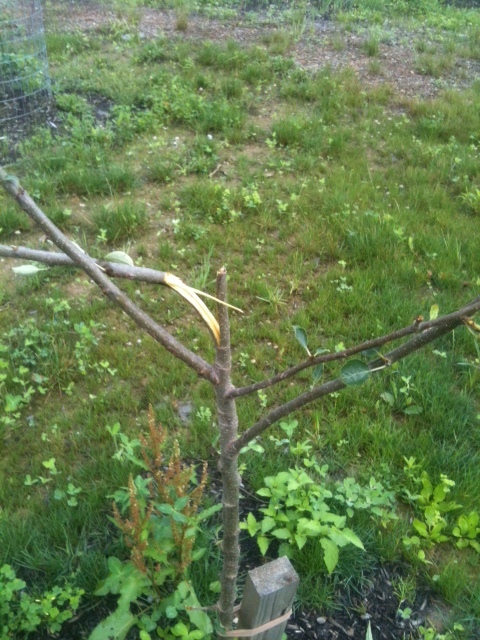 The deer, my resident bucks I suspect, have turned their voracious appetite on to my small apple trees. Yesterday I noticed one with a main branch broken and devoid of leaves. Now this morning three more were even worse off including one that I lost one of only two branches on it. Why they have to pick the week when I literally do not have time to go out and put fencing around the trees I have no idea. The trees have been there since April no problem, now they pick this week to massacre them seemingly overnight. And they don’t just eat the leaves, they rip the tree apart. They’ve browsed before and eaten leaves which I don’t have a problem with but this is ridiculous. I guess after the art show today I’m going to goto Lowes and get 5′ or 6′ fencing and put a hoop around each tree. I suspect with the damage that is done though I could lose at least 3-6 of the trees I planted this year most likely to disease or outright death now that they’ve been ripped apart. Which means I’ll have to order new ones in the Fall and start the whole process all over again. 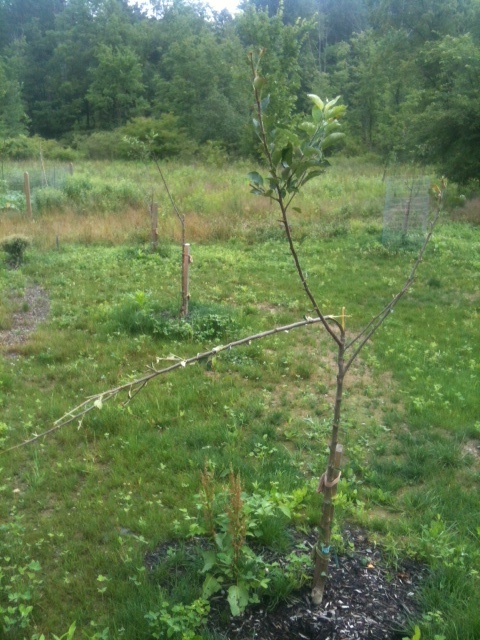 Once the trees are established it won’t matter what the deer do but now I’m not sure why they have to pick on my apple trees…. You can see in the background I used the last of my left over fencing to protect one of the nine. But I really need 6′ tall hoops. The middle tree on the left is down to one branch and about a dozen leaves….I bet it’s a “goner” thanks to the deer. I cut off the broken branches leaving very little “tree” left.